School starts for us (okay, for my son!) in a week and a half. I guess this is pretty late, since so many kids around us, geographically and virtually, have already gone back. Considering that we’re still socked in with fog every morning, and I’m taking a sweatshirt outside for exercise in the late afternoons….well, it doesn’t quite feel like the end of summer. Oh, I’m ready. And I think my son is, too, as much as a teen can be ready for school to start. But here’s the thing–it’s been an incredible summer. The best I can remember for a loooooooong time. Now, honestly, I have to give some major credit to the thyroid meds I started taking a year or so ago that seem to have finally kicked in to really give me back the energy I lost somewhere along the way. Quick “sell”: Ladies, if you’re thinking your thyroid might be low, check it out. And be aware that the numbers stated as “okay” aren’t always, that–as my wonderful doctor says–“Different people feel right at different numbers,” and really talk to your doctor about what’s going on. I am a total and complete convert. Okay, off the med-sell. Basically, I just seem to be at a point in my life where things are coming together. My son has had a good summer too–with all the laziness and creativity and random this-and-thats a kid’s summer should have, I think. Sure, there’s been some boredom, but when I’ve checked in with him, he’s said that that’s a part of how he wants his summer to be. So, okay, then. He’s been doing the teen sleep-in which, combined with my new ability (see above) to wake up happily at six-ish, has meant incredibly productive mornings for me. And then there was the non-heat, which means I’m actually happily functional for walks or board games or necessary errands in the afternoon. The thing is, I’ve hit some kind of balance between work and, well…life. Even, it seems, between fiction writing and other writing, critiquing, and marketing. So I’m able to enjoy all of them and see the progress that’s happening in most of them. Will this last? Well, I certainly hope so. I know, though, that life is ups and downs, twists and turns. My son is starting high school in 12 days–which puts us all into a new world. I’ll be doing more speaking and traveling next year. I’ve got to take on a few new things to do with running the business of this writing thing. And there’s a second draft coming sometime in the nearish future. So change is coming, and any one part of it could tip the scales. Summer, for me, used to be the hardest challenge of the year, a time when I felt hard-pressed to find anytime for myself and guilty about feeling that way. It’s gotten easier, of course, the older my son got, but this year, I swear I heard the CLICK of everything coming together. It was a lovely sound. So, today, I am thankful for a summer that gave me back the ease of vacation, the pleasure of enjoying time off, and a vision of possibilities for the future. And a path into autumn, my favorite season, that isn’t built simply on relief. Wow! Such an awesome place to be in your life! You’re choking me up! I’m very happy for you, Becky. Thanks, Joyce. And congratulations on the new grandbaby–everybody over there sounds pretty happy, too! That’s pretty amazing, Becky. 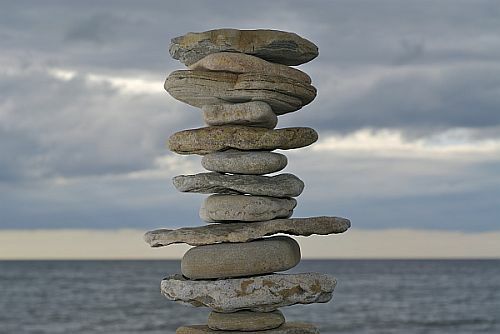 I’m very happy for you, and hope I acheive that wonderful sense of balance one day too. Shoot! I mean kudos! When will I learn to proofread? Becky, when I first met you online 18 months ago I thought you had amazing energy. I’m so sorry to hear how rough you were feeling underneath — and SO glad things are coming together for you now! I remember my pre-thyroid med days. I would come home from work and fall asleep on the sofa then later I’d drag myself to bed. All those years, wasted on sleeping. I’m not a ball of energy medicated, but I sure see the difference. Also I had three miscarriages in those days as well. I found out low thyroid could be the cause. Once fixed, I went on to have tow very healthy daughters. Good that you now have life/work balance. My blood-pressure, ALWAYS very low, had started to go up, too. The first check-up after I’d started on the thyroid, before we’d even hit the right place, it was back down. Thyroid seems to hit everything.